Well-rounded gaming notebook. 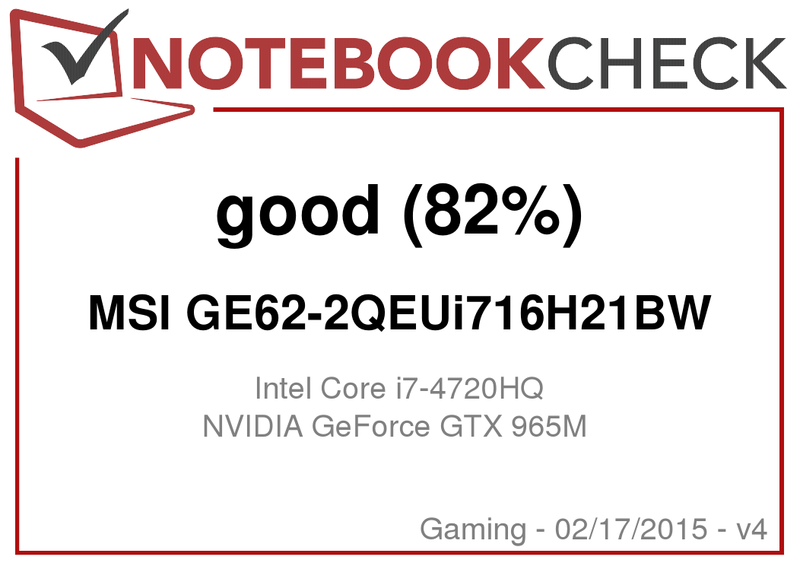 MSI GE62 2QE Apache is not lacking in processing power. The other equipment is also a good match: SSD, HDD, and 16 GB of RAM. The MSI commits one blunder with its built-in 4k display: it is not very bright. With the GE62 2QE Apache, MSI presents a gaming notebook in 15.6-inch format. 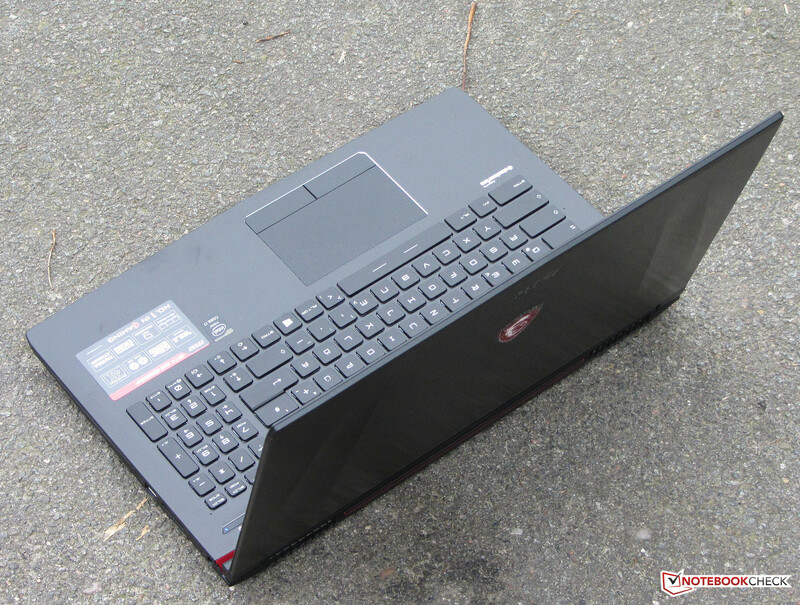 This is a successor to the MSI GE60-2PEi781B, which we have tested previously. The two models do not have much in common. 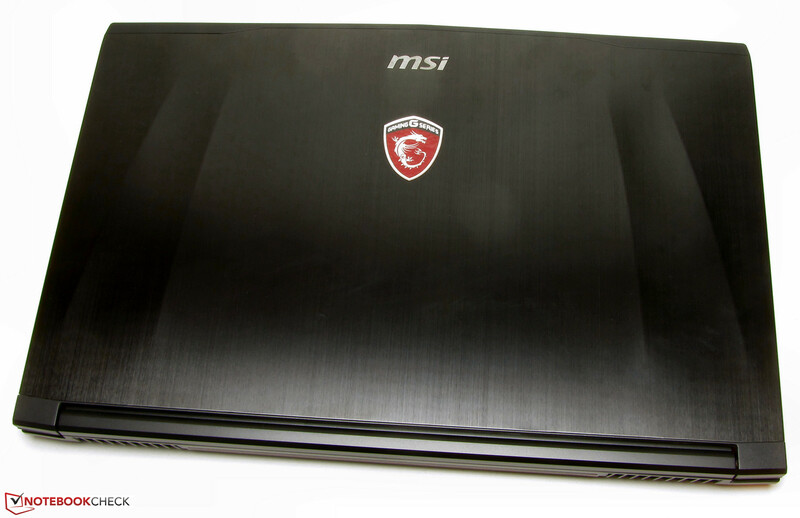 In the GE62, MSI uses a new, somewhat slimmer chassis. In addition, there is a new graphics chip from Nvidia’s GeForce 900M series. Our test report shows whether the GE62 can compete. 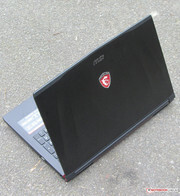 Competitors to the GE62 include such notebooks as the Schenker XMG P505, the Acer Aspire V15 Nitro, the Lenovo Y50-70 or the HP Omen. The GE62's chassis is encased completely in black. A few red elements break up this impression slightly. The covers, as well as the upper surface of the base unit, are finished in brushed metal. The rest of the case is made of plastic. The notebook does not offer a maintenance hatch. 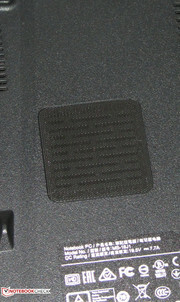 However, the underside of the base unit can be removed (more on this later). In terms of workmanship, the computer offers no cause for criticism. 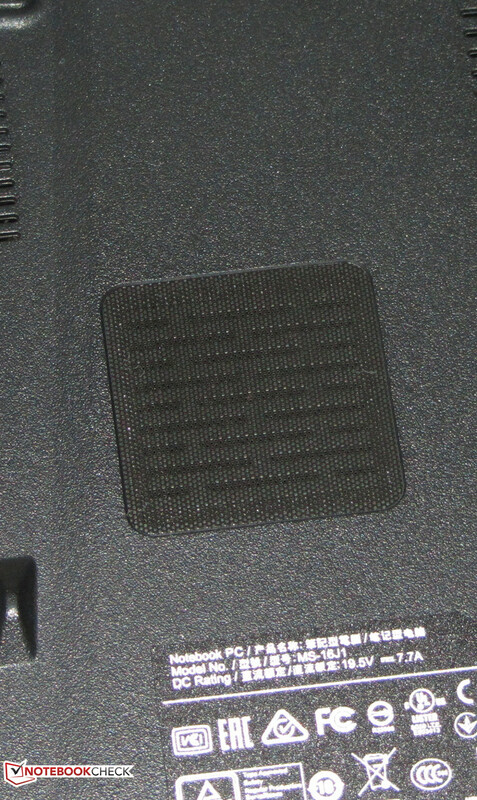 Concerning stability, the picture is slightly different: the upper surface (the area of the optical drive) can be pressed in somewhat. In addition, the lid can be twisted easily, leading to visible image alterations. We would have hoped for more stability from the aluminum back. The hinges hold the lid firmly in position and teeter somewhat. Opening the notebook with one hand is easy. The underside of the lid is finished in metal. 2 sticks can be plugged in at the same time. The interface configuration gives no cause for complaint; the GE62 offers enough ports. 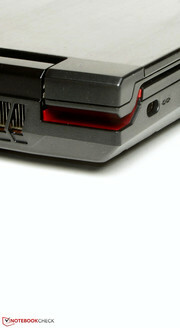 Most ports are to be found on the left side of the case. 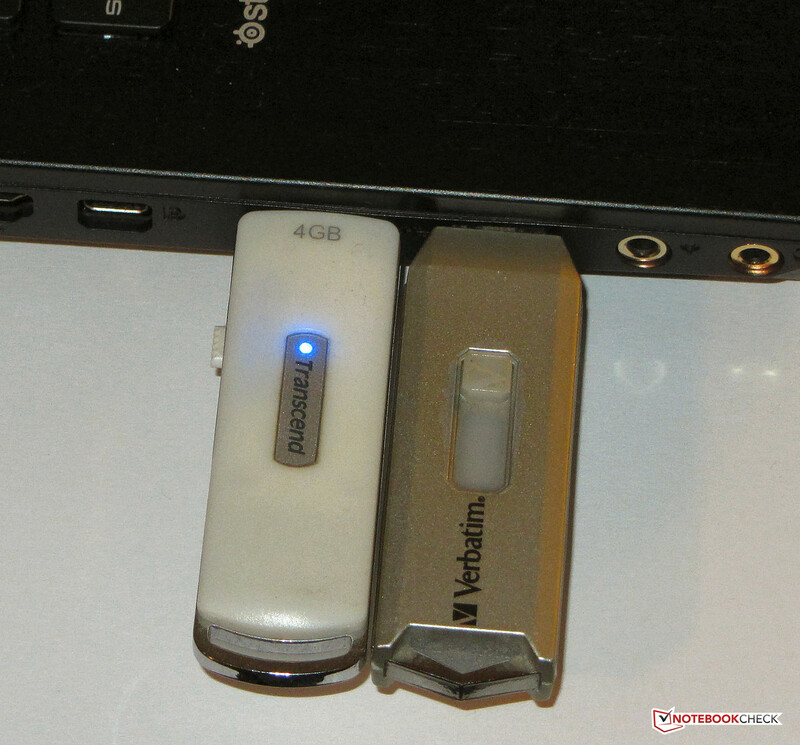 They are set reasonably far apart from each other, so that (for example) the two adjacent USB 3.0 ports can both be occupied by USB sticks (as long as they are not extra wide). The speakers are found on the front side. 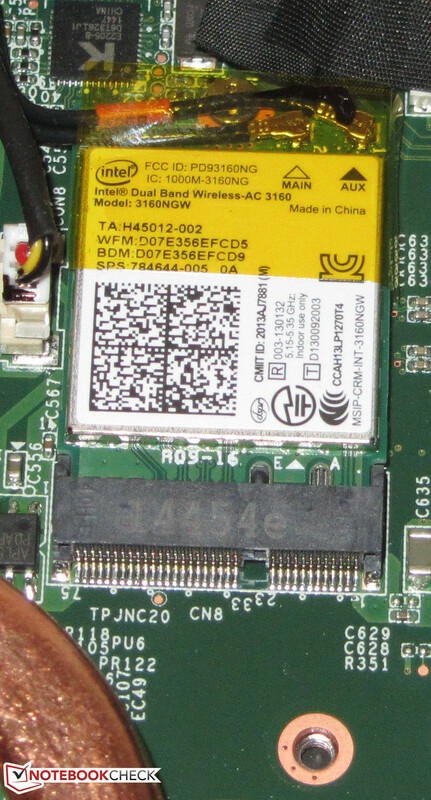 MSI has decided to opt for a wireless module from Intel (Wireless AC 3160) in the GE62, which supports the WLAN standards 802.11 a/b/g/n/ac. 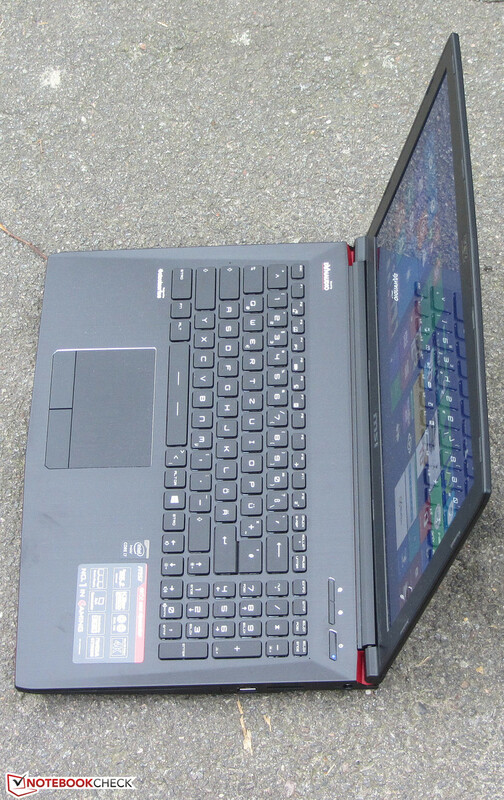 The connection between the router and the notebook remains stable at a radius of 15 meters (~50 ft). In addition to the WLAN adapter, a Bluetooth 4.0 chip is also installed in the notebook. Qualcomm's Killer E2200 Gigabit Ethernet controller handles wired network connections. According to the manufacturer, this chip offers "faster online gaming." This is apparently achieved by giving priority to data packets from games. The built-in webcam produces grainy pictures with a maximum resolution of 1280x720. 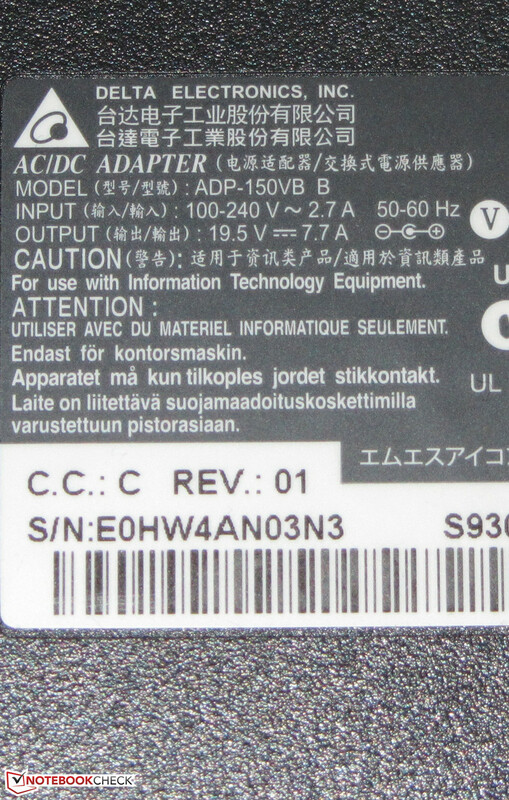 Apart from warranty information and printed instructions, the GE62 includes no additional accessories. 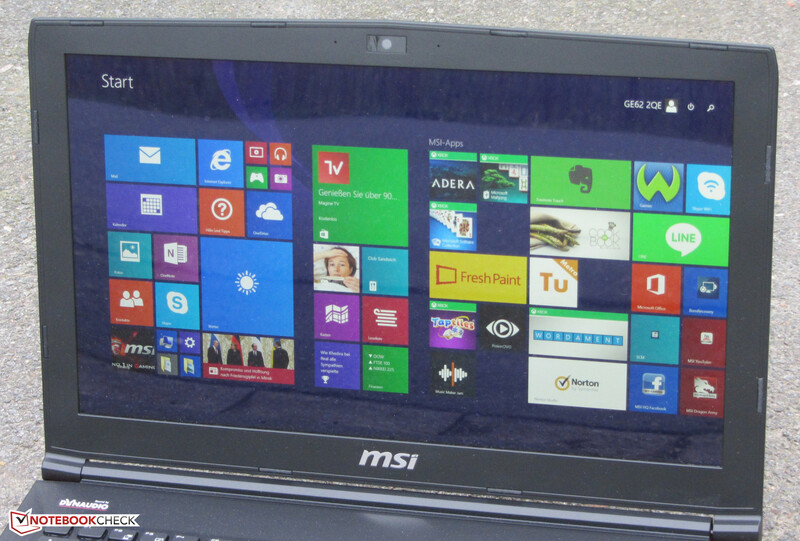 Windows 8.1 (64-bit) serves as the operating system. A recovery volume is not included. Users who wish to purchase the DVD can order one for 49 Euros (~$55) from the MSI Shop. 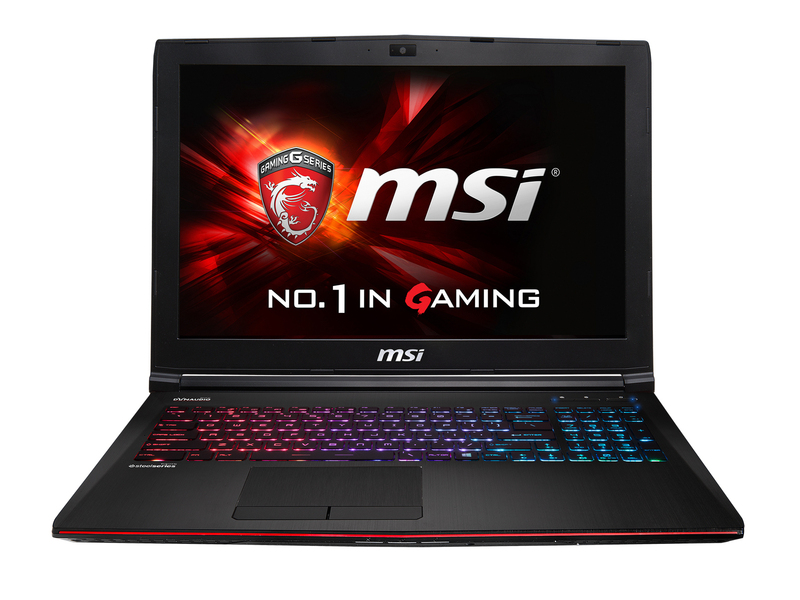 MSI has not equipped the GE62 with a maintenance hatch. However, it is still possible to access the innards: After removing all the screws on the machine's underside, it can be removed with the help of a pallet knife. The user then has access to all the hardware. 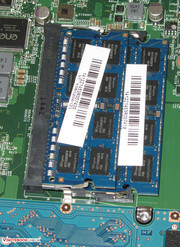 Two memory banks are available; each is filled with an 8 GB module (more is not possible). 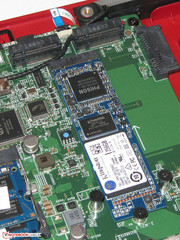 The system hard drive (SSD in M.2 format) can be changed for a faster model or one with more storage space. Alternatively, it can be replaced by two SSDs that form a RAID array. Apart from the SSD, a traditional 2.5-inch hard drive is also included. The hard drive can be changed easily. 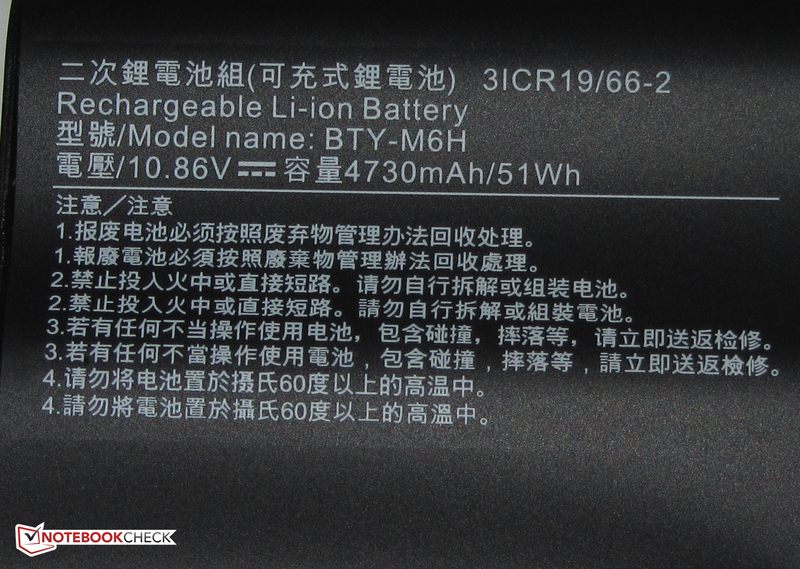 In cases of defects, the battery could also be changed. However, this is not the case for the processor (it is soldered in). 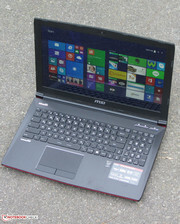 MSI offers buyers a 24-month warranty - including pick-up service. The time can be extended to three years, at a cost of 100 Euros (~$115). 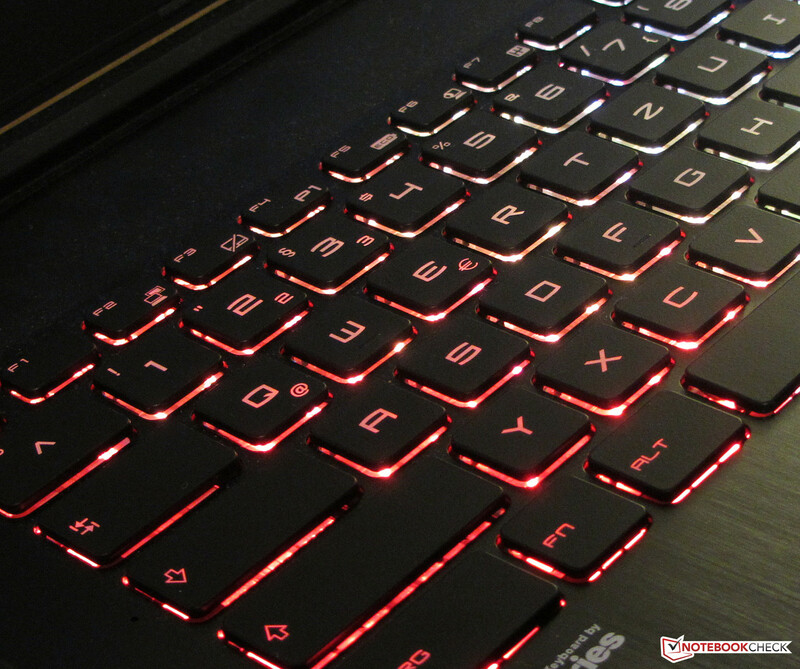 One does not have to spend too many words on the GE62's keyboard, since we have already met the built-in SteelSeries model in other MSI notebooks. 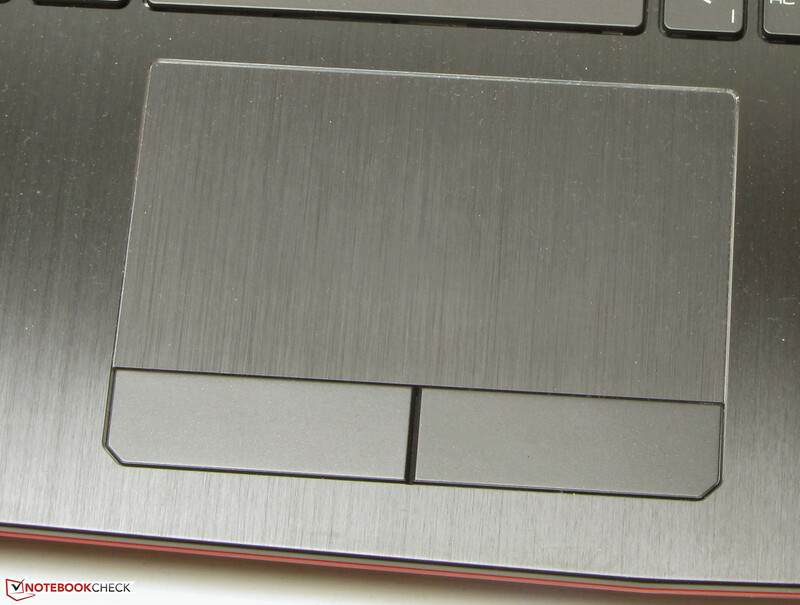 The flat, smooth keys have a moderate stroke and a clear pressure point. The keys also offer a pleasingly comfortable resistance. Overall, the keyboard offers a good feel when writing. First-time users will still have to get used to the layout, since not all the keys are in the places that one would expect. The keyboard also offers multicolored backlighting. Instead of a mouse, there is a multi-touch capable model. 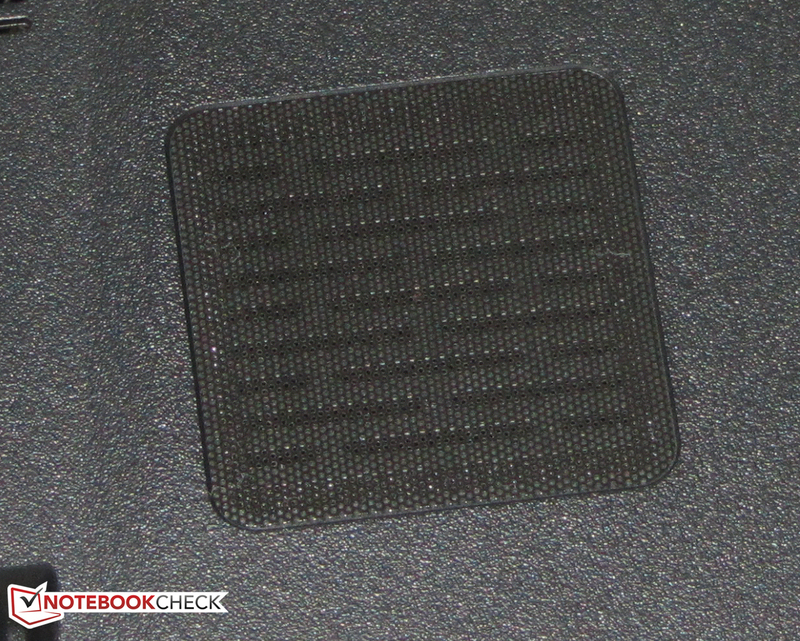 The pad has an area of about 10.9 x 6.1 cm (~4.3" x 2.4"). The finish matches the brushed metal optics of the wrist rest, and it is easy to slide the fingers across it. Gesture commands present no problems. Two mouse keys are found underneath the pads. These offer a short stroke and a noticeably audible (and tangible) pressure point. The keyboard has been equipped with backlighting. 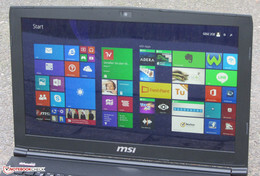 The touchpad is multi-touch capable. The test machine provided to us presents a glossy 4k display (3840x2160 pixels). 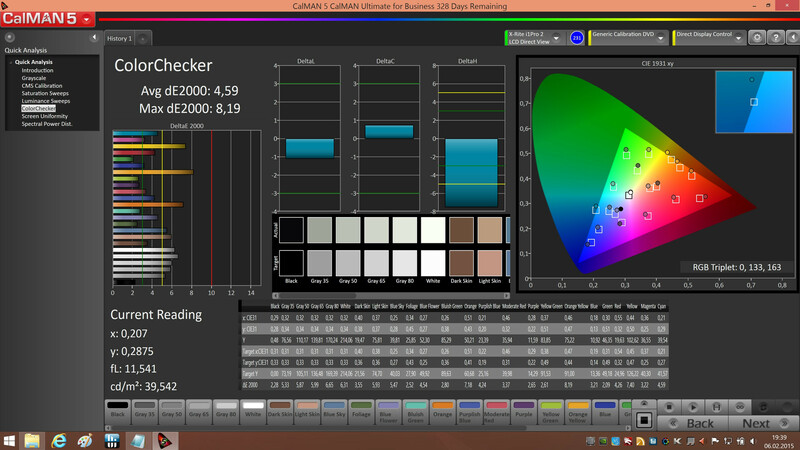 Users who want a matte panel will have to opt for a reasonably priced GE62 model with a Full HD monitor. The built-in 4k display does not attract attention for its high brightness; indeed, the opposite is the case: we measured a luminosity of 202 cd/m². Illumination is also not the best. Here the monitor reaches a value of just 63%. The purchase price of the machine is around 2000 Euros (~$2270), and for this price we expect much more. 4k monitors like those of the Schenker XMG P505 (332.7 cd/m²; 86%) and the Acer Aspire V15 Nitro VN7-591G-75TD (303.1 cd/m²; 87%) prove that there are better options. Contrast (676:1) and black level (0.34 cd/m²) offer more favorable results. 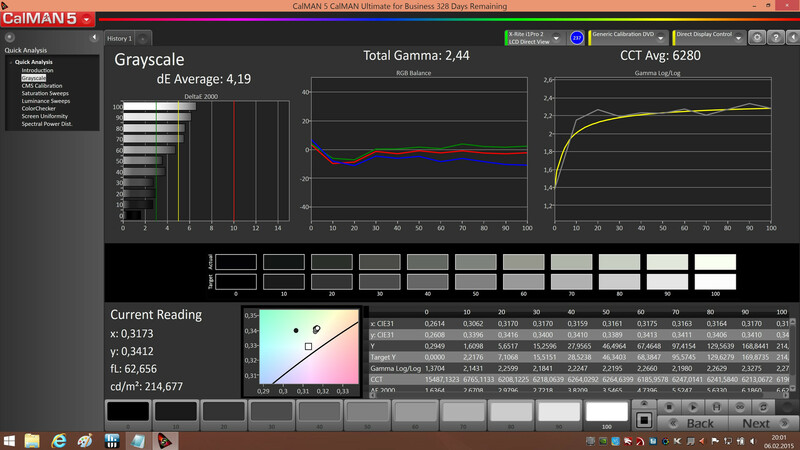 Here the GE62 performs relatively well. However, it cannot compete with the values of the Schenker XMG P505 (1643:1; 0.21 cd/m²) and the Acer VN7-591G-75TD (1003:1; 0.3 cd/m²). 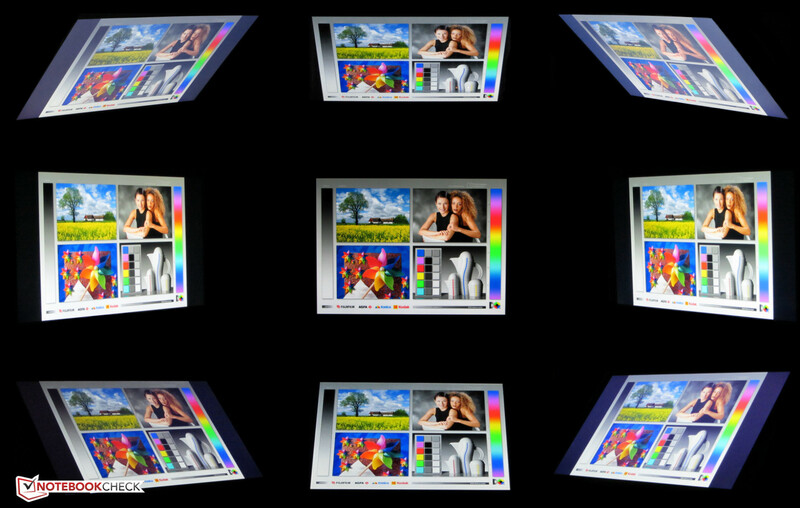 The 15-inch model does not cover the AdobeRGB and sRGB color spaces; values of 48% and 68%, respectively, are only average. In factory condition, the monitor's average DeltaE-2000 deviation was at a level of 4.59, just barely missing the target area (DeltaE below 3). The panel does not display a blue tint. We could only minimally improve these good values with some calibration. MSI has decided against an IPS model for the GE62, which is why the monitor can be viewed from all positions. Outdoor use is only possible in shaded areas; otherwise, the low brightness and glossy surfaces will make things difficult. 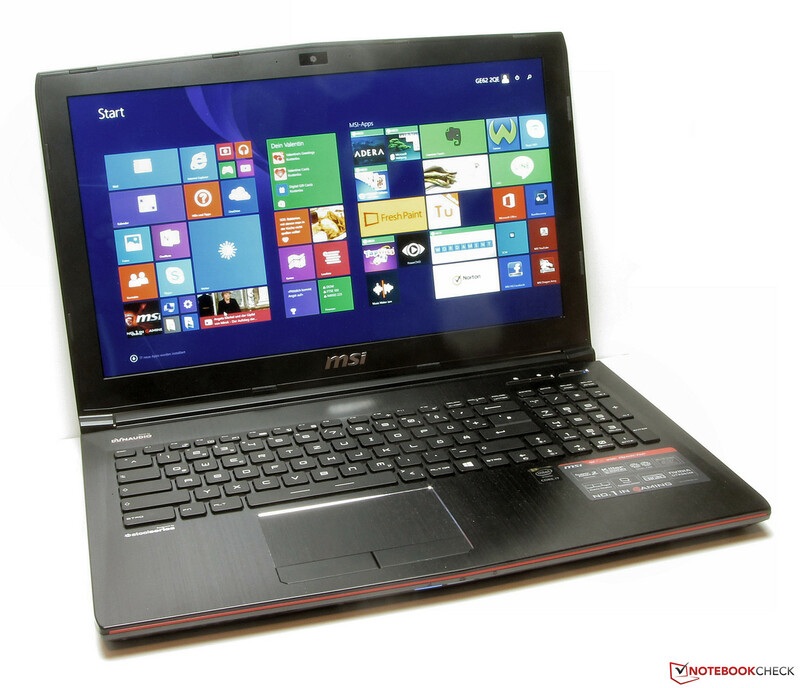 With the GE62, MSI has a gaming notebook in 15.6-inch format in its product range. 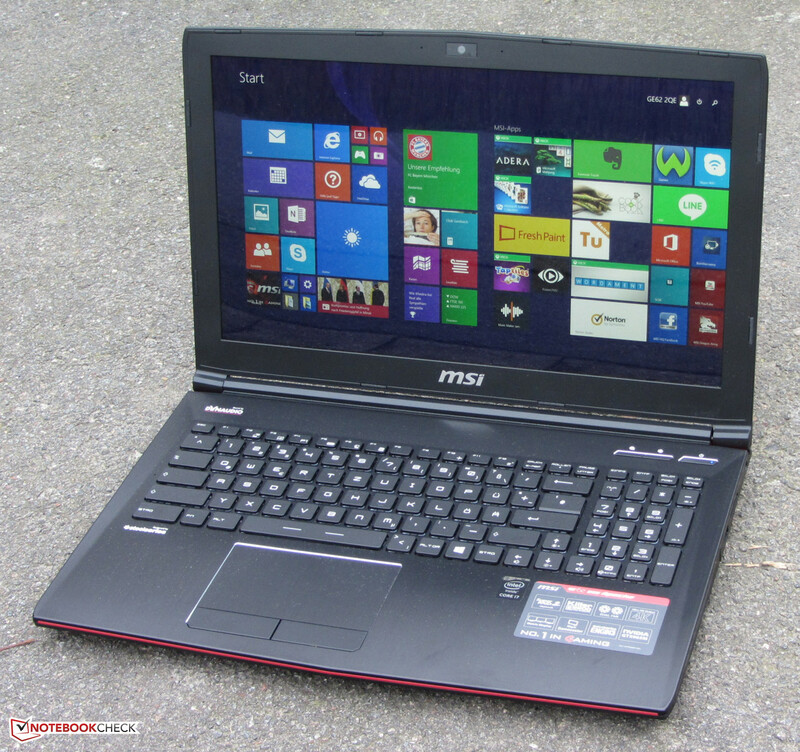 For this test, we used the top-of-the-range model at a price of 2000 Euros (~$2270). Users willing to compromise on hardware (Full HD monitor, 8 GB of RAM, no SSD) can get their hands on the notebook for just 1500 Euros (~$1700). 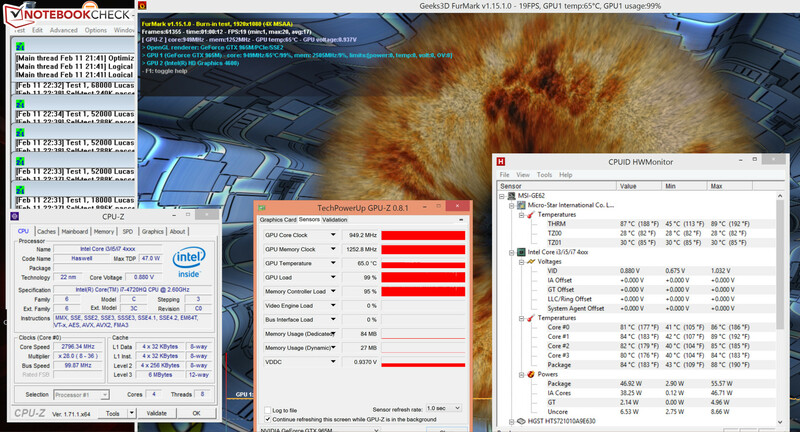 Thanks to the Core i7-4720HQ quad-core processor (Haswell), the GE62 is not lacking in processing power. The CPU does not belong to the class of Spartan ULV processors; it uses a traditional mobile processor with a TDP of 47 Watts. 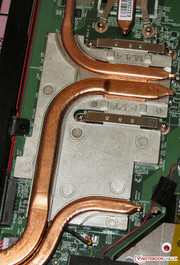 The CPU runs with a base speed of 2.6 GHz. Using turbo, the speed can be increased to 3.4 GHz (four cores), 3.5 GHz (two cores), or 3.6 GHz (one core). The Turbo can also be used when connected to a power supply: the CPU Cinebench tests run the processor at 3.3 GHz (Multithread) and 3.4 to 3.6 GHz (Single thread). When the tests are run under battery power, the clock rates come out slightly lower (Single thread: 3.2 to 3.5 GHz; Multithread: 2.6 GHz). It is not surprising that the system is fast and smooth. A fast SSD, a powerful processor, and 16 GB of RAM make this possible. The results in the PC Mark tests come out very well. However, HP Omen performs even better despite a nearly-identical CPU. 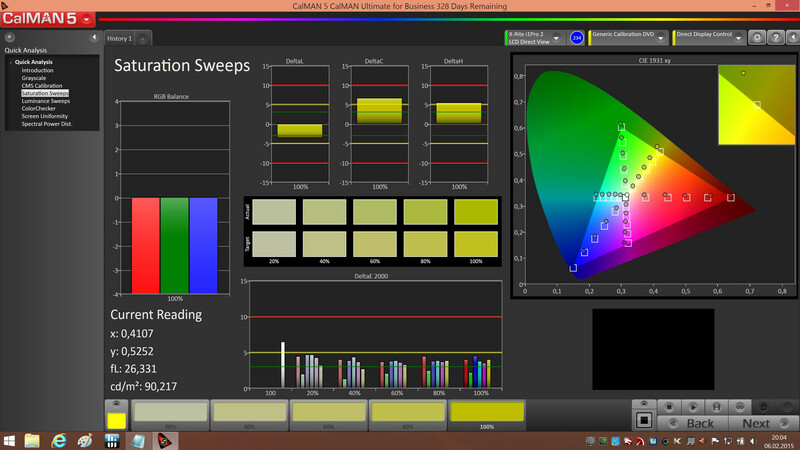 The higher resolution of the GE62 monitor (4k vs. Full HD) is responsible for this. When the PC Marks are run with a resolution of 1920x1080 pixels, the MSI's ratings rise to a comparable level (see table). The GE62 uses a solid-state disk from Kingston as its system hard drive, offering a capacity of 256 GB. 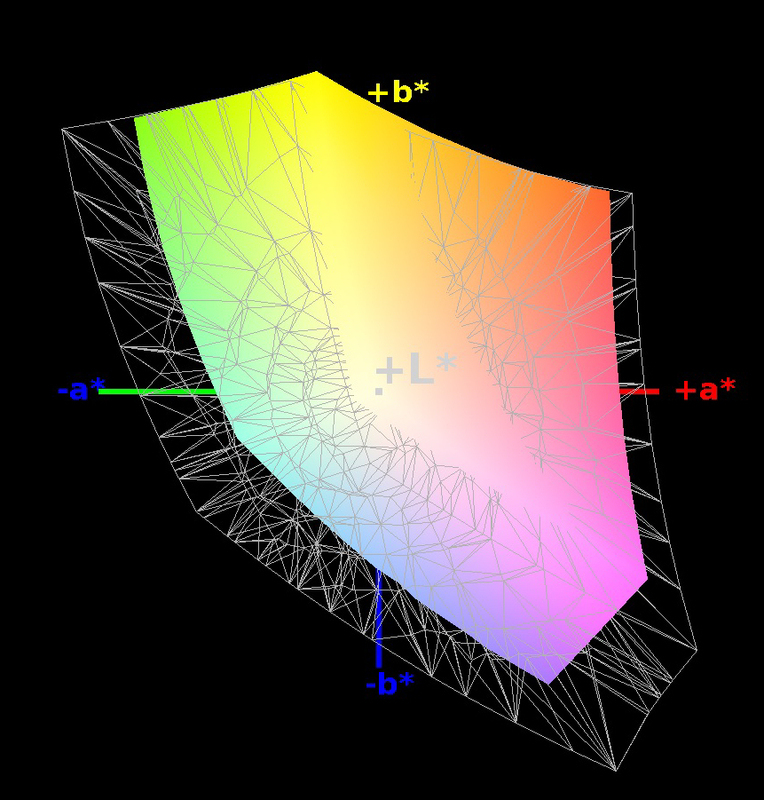 It uses a model in M.2 format. The transfer rates of the SSD look good. However, it is not the very best option: the user has the option of installing two solid-state disks in the notebook and using them in a RAID array. A comparison with the similarly-equipped MSI GS60 2QE Ghost Pro 4K shows that the transfer rates increase noticeably. 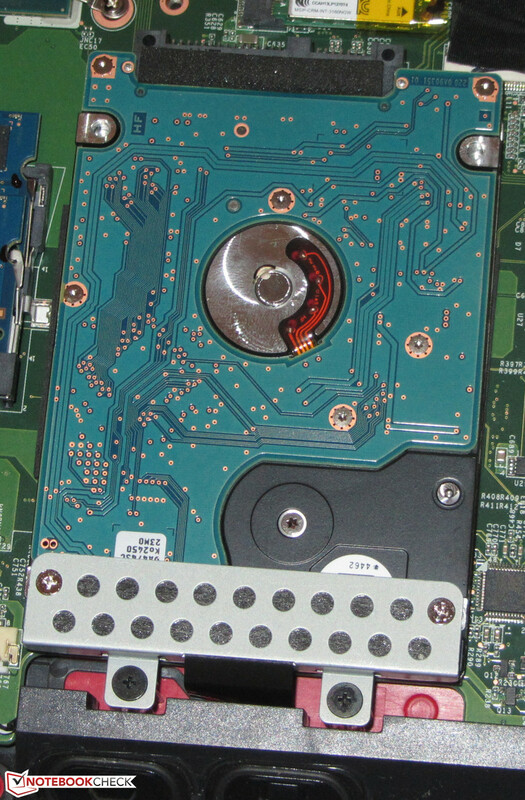 Apart from the solid-state disk, there is also a traditional hard drive (2.5 inch). This offers a capacity of 1 TB and runs at 7200 revolutions per minute. 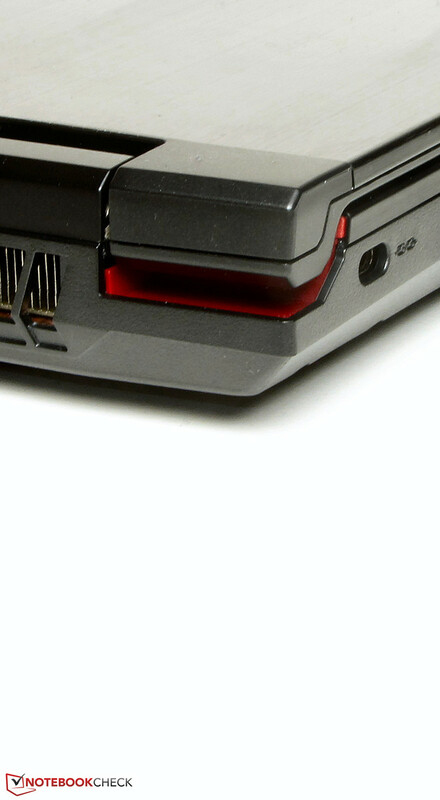 The GE62 is equipped with a dual graphics solution (Optimus). This consists of Intel's HD Graphics 4600 and Nvidia's GeForce GTX 965M. Intel's chip takes care of everyday tasks and battery use. The GeForce is responsible for power-hungry applications like computer games. The switch between cores is achieved automatically, but there is always the possibility to switch manually. The GeForce GTX 965M uses an entry-level model in the GPU upper range. It runs at a base rate of 924 MHz. With Turbo, the speed can be increased to 949 MHz. 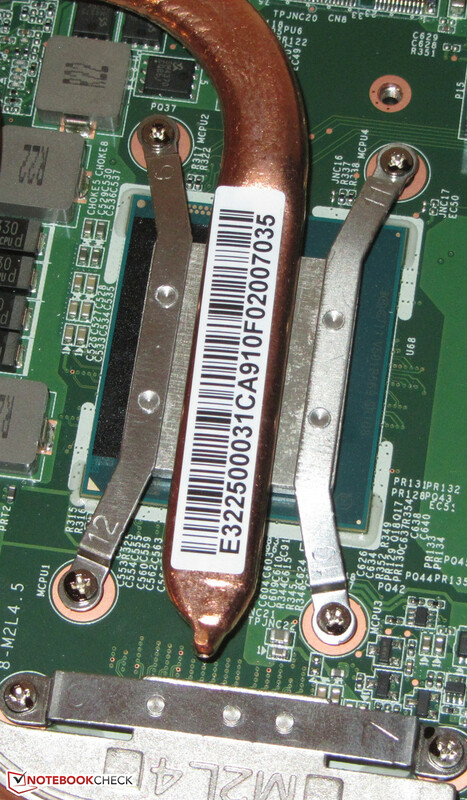 The GPU has a 2048-MB GDDR5 memory device (128-bit interface) at its disposal. The results in the 3D Marks are on par with similarly equipped notebooks like the Schenker XMG P705. The GE62 lags noticeably behind the XMG P705 only in the Ice Storm Test. Apparently, the MSI machine's CPU and GPU ran this test below their full cycle rates. The GE62's hardware allows it to play most current games at 1920x1080 pixels and very high quality settings. Only a few extremely demanding games, such as “Assassin's Creed Unity” and “Company of Heroes 2”, overwhelm the notebook at their maximum settings; here some resolution and details have to be sacrificed. We encountered problems with some older games.”Skyrim: The Elder Scrolls” led to massive image problems. “Dead Space 3” refused to start, because apparently the performance of the graphics chip was not sufficient. This is obviously not true: “Dead Space 3” runs smoothly with even noticeably weaker graphics cores. Is it possible to use the full monitor resolution? We tested out a few games in 4k (3840x2160) with the same quality options as our regular testing conditions. 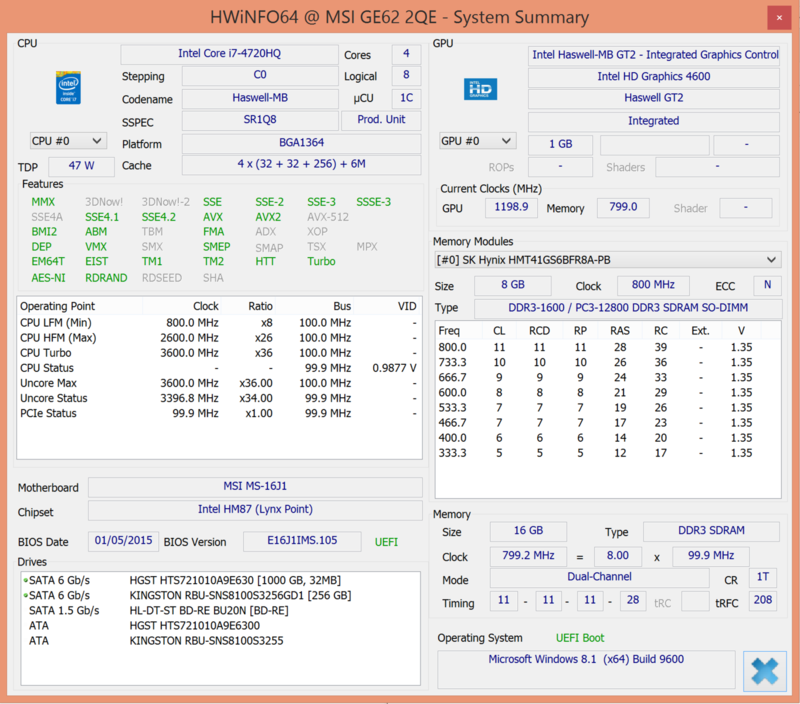 In idle mode, the GE62 does not emit a single peep; the fan and HDD are quiet. As a rule, the fan runs at minimum speed. The noise level is then on par with the Aspire V15 Nitro. The Schenker XMG P505 can get somewhat louder than the competition. Under load, the GE62's fan really kicks into motion. During the stress test, we measured a noise level of 52.4 dB(A). The Schenker XMP P505 also overshoots the 50 dB(A) mark, while the Aspire runs more quietly. The GE62 got through the stress test (Prime95 and FurMark run for at least an hour) on and off battery power with varying results: while connected to power, the graphics core ran at full speed (949 MHz). The processor clocked from 2.8 to 2.9 GHz. We reached this state on battery power as well - at least, for the first ten minutes. Then the GPU (2.4 to 2.6 GHz) and especially the GPU (135 to 500 MHz) throttled back markedly. The temperature reached just under 50 °C (~122 °F) at many points on the upper surface of the base unit, becoming uncomfortable for the user. 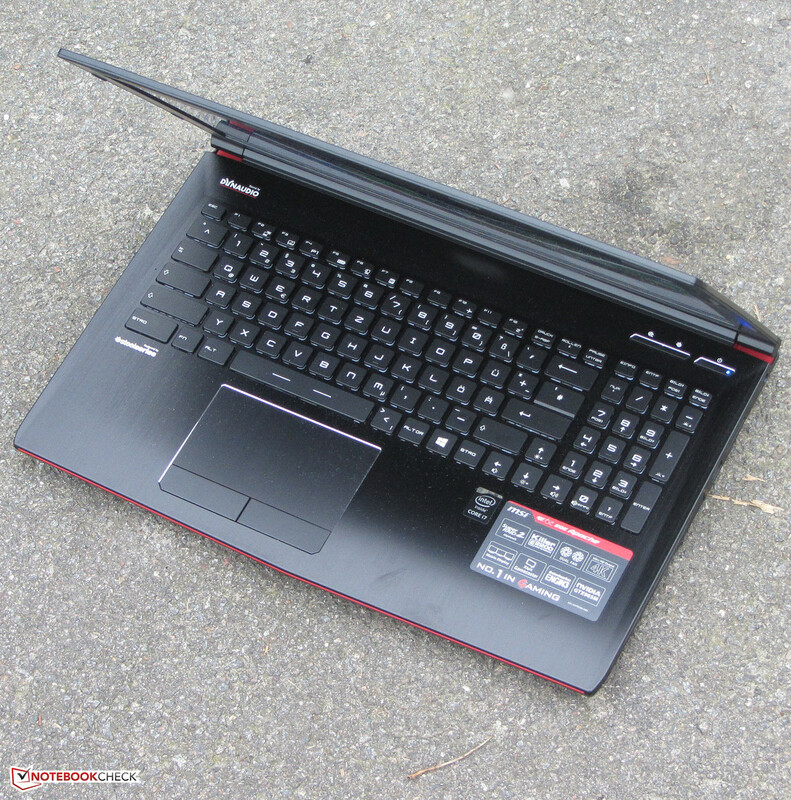 The Schenker XMG P505 warms up even more, since it is equipped with a stronger graphics core. 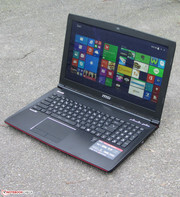 The MSI Notebook is undercut by the Acer Aspire V15 Nitro VN7-591G-75TD in terms of heat build-up. (-) The average temperature for the upper side under maximal load is 45.3 °C / 114 F, compared to the average of 32.9 °C / 91 F for the devices in the class Gaming. (-) The maximum temperature on the upper side is 49.9 °C / 122 F, compared to the average of 39.3 °C / 103 F, ranging from 21.6 to 68.8 °C for the class Gaming. (±) In idle usage, the average temperature for the upper side is 33.5 °C / 92 F, compared to the device average of 32.9 °C / 91 F.
(-) The average temperature of the palmrest area of similar devices was 28.7 °C / 83.7 F (-14.8 °C / -26.6 F). The GE62's stereo loudspeakers are found in the front area. There is also a subwoofer, which is placed on the underside. The sound of the 2.1 system does not knock the listener's socks off, though. Despite the subwoofer, the notebook is lacking in bass. For a better sound experience, we recommend either external speakers or headphones. As with the competition, the energy needs of the GE62 while idling are clearly above 10 Watts. This is normal for this notebook class. During the stress test, the power consumption rose to 136 Watts. This kind of scenario hardly ever occurs in everyday use. 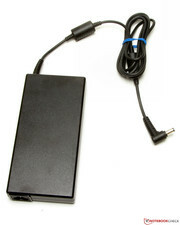 In daily gaming use, power consumption will probably hover around 90 Watts. 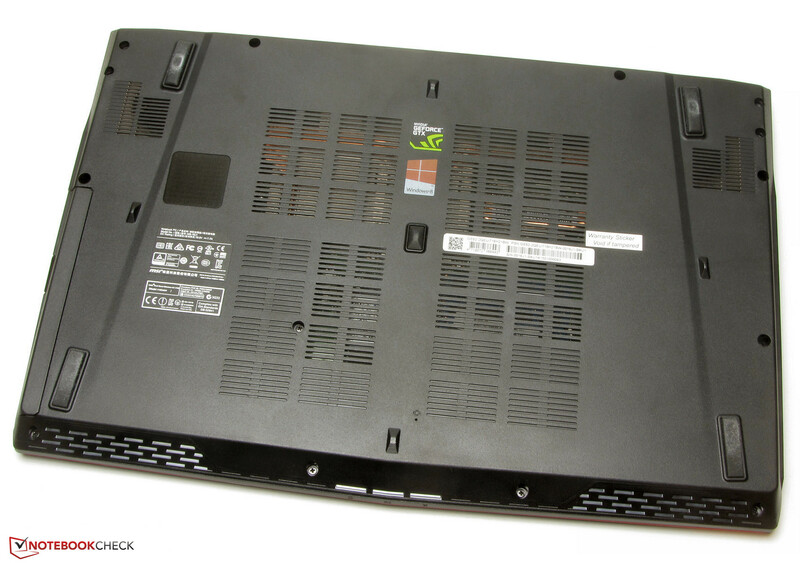 This is also the case for the Acer Aspire V15 Nitro VN7-591G-75TD. The Schenker XMG P505 requires more energy because of its more powerful graphics chip. While idling, the GE62 manages a run time of 4 hours, 27 minutes. The competing Schenker XMG P505 (2:54 h) gives up earlier. The idle mode was tested via the Reader's Test from Battery Eater. The display runs at the lowest brightness level, the energy saver profile is activated, and the wireless modules are deactivated. Under load, the GE62 shuts down after 59 minutes. The Schenker XMG P505 (1:11 h) manages a few more minutes. The runtime under load was measured with the Battery Eater Classic Test, during which the monitor is on full brightness and the high-performance profile and wireless modules are activated. The practical WLAN test causes the GE62 to shut down after 2 hours, 59 minutes, equal to the Acer Aspire V15 Nitro VN7-591G-75TD (3:01 h). During this test, web sites are automatically loaded in 40-second intervals. The energy saver profile is active, and the display brightness is at about 150 cd/m². We tested the playing duration of videos by playing the short film Big Buck Bunny (H.264-coding, 1920x1080 pixels) in a continuous loop. The wireless adapter is deactivated and the display brightness is set at about 150 cd/m². 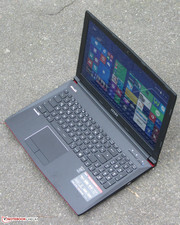 The MSI Notebook manages for 2 hours, 40 minutes. The Schenker XMG P505 achieves a duration of 2:20 h.
We also tested run times while gaming, by running the integrated benchmark of the racing game “GRID: Autosport” (1920x1080, Very High, 4x MSAA) on a continuous loop. The 15-inch model managed 45 minutes. The runtimes of the GE62 put it in a range that we are used to in potent gaming notebooks. In an absolute sense, these values are definitely meager. 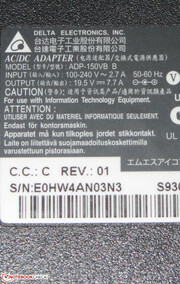 The battery has more the function of an emergency power supply. The MSI GE62 2QE Apache offers the user high application and gaming performance. 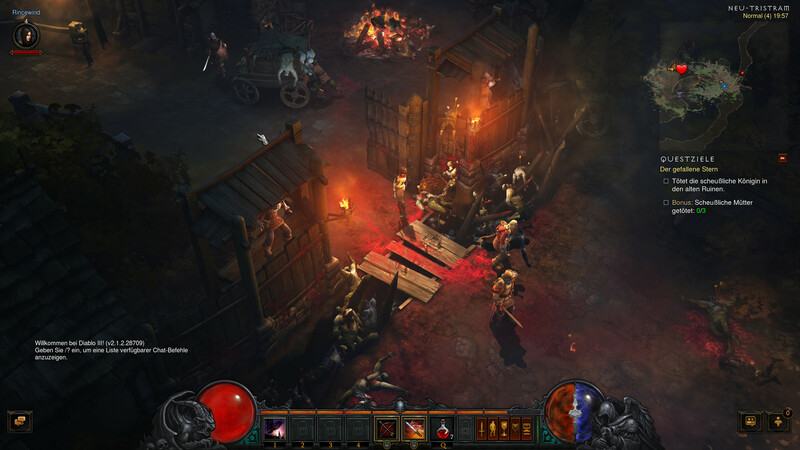 Most current games can be played smoothly in high resolution (Full HD) and with high settings. Despite this performance, the chassis does not warm up excessively. 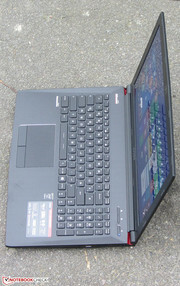 The notebook is not lacking in storage space: Apart from a solid-state disk, the computer also boasts an HDD. Both drives can be easily swapped for models with more storage space. One does not necessarily expect this with a gaming notebook, but the GE62 also offers a good keyboard. The 4k display of the highest-class variant disappoints us a little. It is not particularly bright and has very uneven illumination. This should not be the case with a 2000 Euros (~$2270) notebook. Users who find much to like in the GE62 but do not want to spend 2000 Euros (~$2270), can get their hands on a less well-equipped variant. 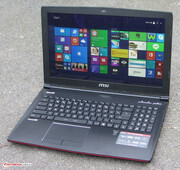 With a Full HD monitor, 8 GB of RAM and a terabyte hard drive, the machine is available from 1500 Euros (~$1700). 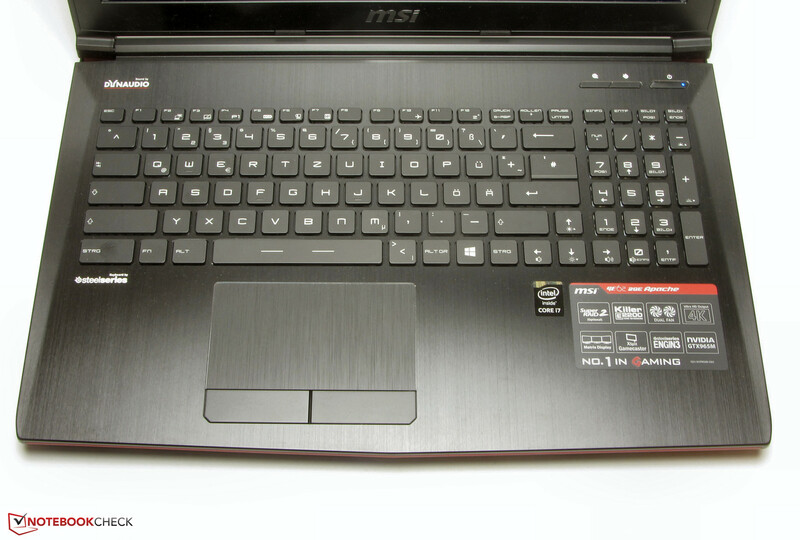 In Review: MSI GE62-2QEUi716H21BW. 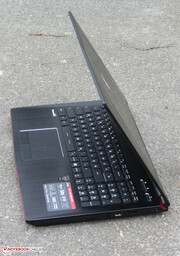 Test model provided by MSI Deutschland. 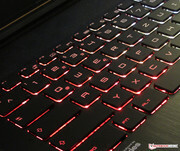 The keyboard offers multi-colored backlighting. Our test machine is equipped with a Blu-Ray burner. ... hold the lid firmly in position. The subwoofer is found on the underside. ... the underside can be removed with a pallet knife. The processor is firmly soldered in. 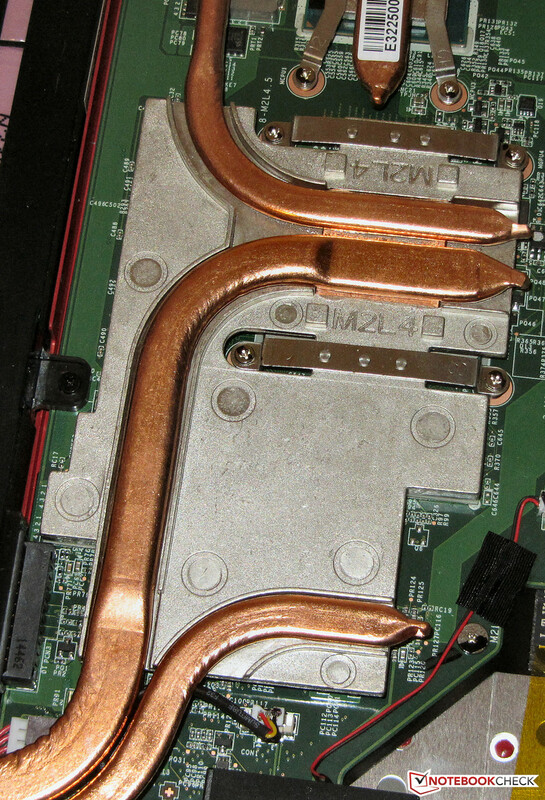 A large cooler bleeds off heat from the GPU and VRAM. The Notebook includes two working memory banks. A SSD takes care of the operating system. Two further free M.2 slots are available. 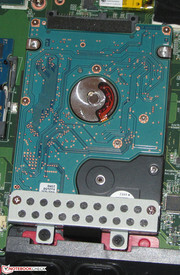 A traditional hard drive provides data storage. ... is secured with just one screw. The capacity amounts to 51 Wh. The power cord brings the weight up to 525 grams. The nominal capacity is 150 Watts. The application and gaming performance. And the ability to build in more hard drives. 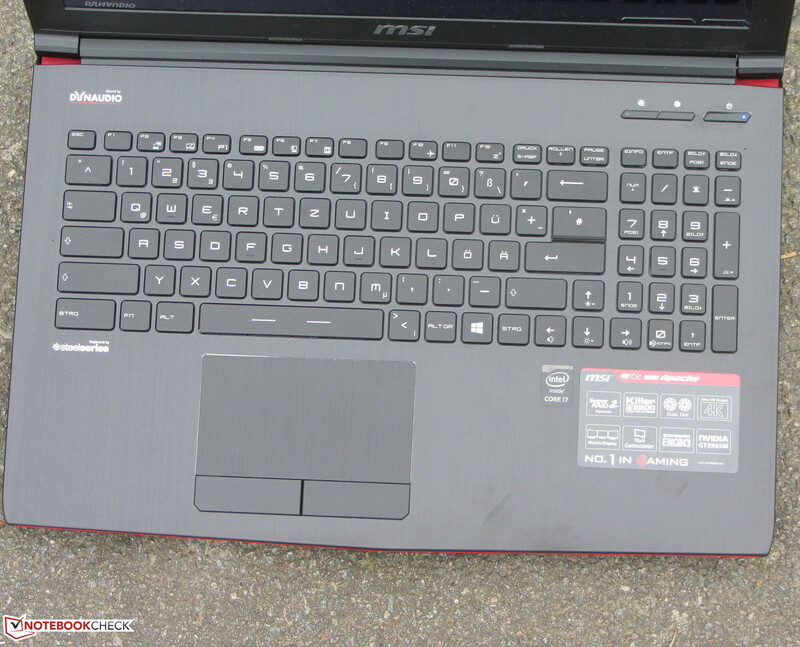 MSI still uses its own keyboard layout, one which doesn't offer any apparent benefits.